i have a definite love/hate relationship with spring cleaning. i look forward to and dread it at the same time. i hate cleaning bathrooms – but i love when they’re clean! i hate dusting – but i love having clean surfaces! i hate vacuuming – but i love seeing the clean lines on a newly-vacuumed floor! you get the picture. the only part about spring cleaning that i DO love is cleaning out and re-stocking my pantry. i don’t know why…maybe i just like having a mini grocery store in there, always having what i need instead of having to run to the actual grocery store to get it. plus, since moving to the states, i’ve been introduced to couponing, and though i do not profess to be anywhere the extreme couponers you see on tv, it’s still fun to get a deal and stock up on a few things that we use all the time. chocolate syrup, check. fruit snacks, check. though when you do buy things in quantity and “stock up” on lots of things, you sometimes forget what you have – and forget what you’ve run out of, always assuming you still have some in your pantry. 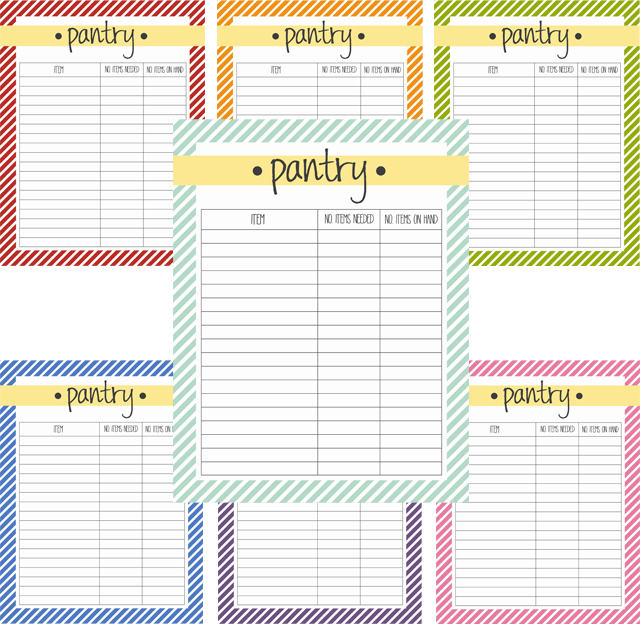 which is why i made this little printable pantry list for myself – so i can easily see what i still have on hand and what i need to buy more of. you can use a pencil to make it easy to update, or you can laminate/page protector it and use a dry-erase marker on it. the point is that you’re going to be updating it often enough that you don’t want to have to re-print it every time. the first thing you need to do it date your list at the top. this will remind you when the last time you updated it was. the second thing is to write all of the food items that you have or want to stock up on in your pantry. even if you don’t have the item yet, still write it in because it will remind you of it. third, think about how many units, or what amount you’d like to have of each item. for example, you might want 4 cans of corn. or you could want 10lbs of flour – use whatever measurement makes sense for that item. fourth, go through your pantry and write down the number or amount that you already have for the items on your list. you can easily see the amount you still need to get your “ideal” pantry. having said that, this does not mean that you have to run out and spend a ton of money to make your list complete. i certainly don’t have all the items i need or want in my pantry. BUT i do look for sales and when something on my list goes on sale i get several of them. if you have items on your list that don’t usually go on sale, consider saving up to buy a lot of them OR you can do what i do and buy 1 every time you go to the store. example: water. this is not really a pantry item, but it’s something i like to store. every time i go to costco i buy a case of water. weather i “need” it or not. it’s easy to build up a supply this way because you don’t part with your money all at once and believe it or not, that item you buy every time you go to the store will add up fast. once you’ve met your goal, move on to a different item. as for where i keep my list? well, i just put it on a cute-looking clipboard and keep it in my pantry, of course! or you could use a dry erase binder to keep it altogether in your pantry, too. red, orange, green, blue, purple, pink, teal. 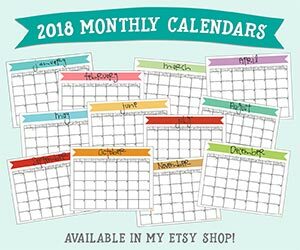 i hope this helps you out in your “stocking up” and “keeping it organized” efforts! Thanks, Kirstylee! I was doing the same thing, so I had to come up with something to stop myself from wasting/not having what I needed! Hope you find it useful! Love your designs . But when i click on them to print anything on your page to print actually it doesnt print instead its a blank page of paper that scrolls out. Hi Emily! So glad you like them! And I’m so sorry they’re not printing for you. The link should open up a PDF file – I haven’t heard of any problems from anyone else and they print fine for me…do you have adobe reader? Have you checked your printer settings? Those are the only thing I can think of to try. Let me know if it doesn’t work for you….